The ASX 200 clawed back +4 points today after dropping 69 yesterday although it was hardly inspiring considering US Futures were trading up +0.35% during our time zone while Asian markets overall recovered from yesterday’s declines – the Japanese Nikkei the best in the region up +2.50% after losing ~3% yesterday while the rest of Asia was mostly higher, China the exception down by around 1%. No real economic data of note out today however some interesting stock news with Wesfarmers making a bid for troubled rare-earth miner Lynas (LYC) while Challenger Financial (CGF) outlined an expansion to their alliance with Mitsui Sumitomo Primary Life of Japan which saw that stock up +9% during the session, although it is coming off a low base. Kathmandu (KMD) out with results + a few other bits and pieces. The defensive sectors of Utilities and Real-Estate did best today, however the material stocks were also bought into weakness outperforming the broader market. 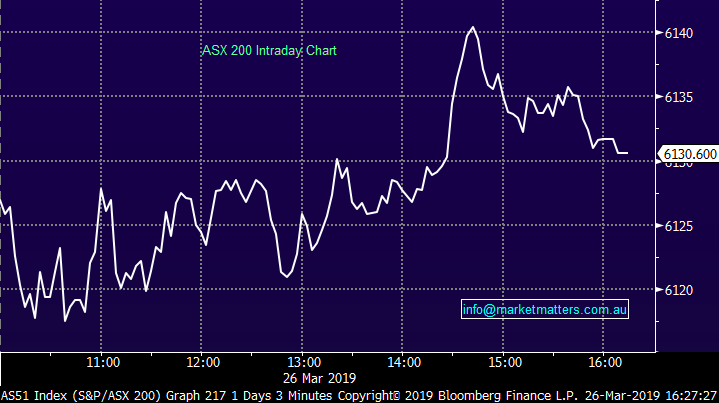 A few stocks caught my eye outside the major news stories today …QBE Insurance (QBE) hit -2.18% as global interest rates continue to slide which is a headwind for QBE earnings (most of their portfolio is held in US bonds). 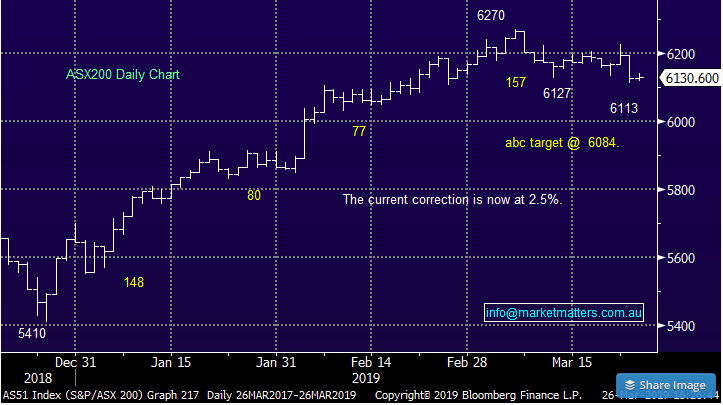 We sold QBE around $12.50 last Friday for that reason however will look at it again into weakness and particularly when global interest rates bottom. Last year QBE was having internal issues but the macro environment was supportive, this year, new management have improved the business largely through simplification and have started to deliver on expectations, yet now we have the macro moving against them. This will certainly be a stock to own again and they’ll be a time when both influences on will be working in unison – it’s certainly been a while. Eclipse (ECX) was whacked last week dropping from $1.88 to 83c on a big profit downgrade while the selling has continued, today the vehicle leasing business dropped another -12.3% to a 57c close – we have no interest at this stage. 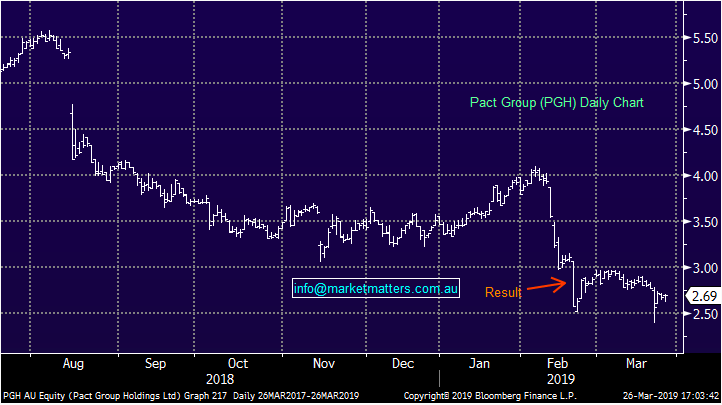 I meant to write about this yesterday, however the seller of Pact Group (PGH) +0.75% through UBS was Ubique Asset Management which is run by ex-Perpetual Fund Manager John Harbot. They sold their 23m shares at $2.50 valued at ~$68m. They manage around $260m in total but in a few select positions, like Cleanaway (CWY) which they own $142m worth of stock speaking for 4.5% of the company and Southern Cross Media they have $73m worth shares. Reports show hedge funds bought the line. We’ve also bought a few shares of late. 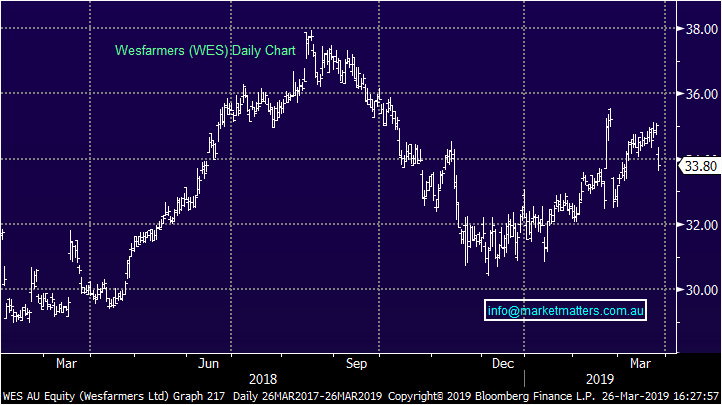 A cashed up Wesfarmers (WES), -3.51% – post Coles (COL) demerger and coal asset sale – struggled today after making its first move in its expansion plans with a $1.5b bid for rare earths miner and processor Lynas (LYC), +35.05%. The bid at $2.25/share was a ~45% premium to yesterday’s close before the stock rallied 54.5c today. Wesfarmers believes the deal has significant synergies with its existing chemical business while also acknowledging the need for further capital investment to ramp up Lynas’ processing assets and Mt Weld mine. Many in the mkt think this is a strange one with a lot of hurdles to overcome. Lynas has been on the nose the past 12 months as it continues to work through environmental issues with the Malaysian government. Tapping out just shy of $3 last May, the stock has been on a volatile decline since the new Malaysian government ran their eye over the processing plant. So far, no major issues have been uncovered with the plant, although Lynas do continue to work with authorities to ensure the facility is up to scratch. One key hurdle for the deal to progress will be the status of the licence required to continue operations in Malaysia. The licence is up for renewal in September and while many suspect the company will be stretched to achieve approval in time, the company seems reasonably confident that it will be renewed. A target that flew under our radar – we have recently discussed the chance the Wesfarmers would make a move on a mining chemicals play like Orica (ORI). It does seem to make sense though, with a number of similarities seen between the two operations plus of course the Lynas share price has been under stress. 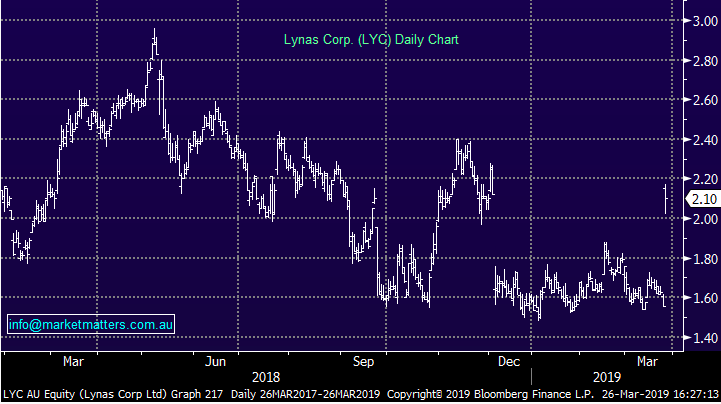 The LYC share price is trading near 12 month lows so shareholder approval may still be an issue despite offer being at a 44.7% premium to last traded price. LYC was trading around $2.25 as recently as December. Coles (COL), +2.22%, pushed higher today on news of an agreement it has signed with UK listed Ocado Group. Ocado is a world leader in innovation for grocery supply chains and will be bringing its smart platform (OSP) technology down under into two new Coles distribution facilities, or Customer Fulfilment Centres, in Sydney & Melbourne by FY23. The project will cost around $150m over the next four years prior to the launch. Ocado’s product is a highly automated system that will do the bulk of the work inside the distribution centres by collecting groceries for online orders and readying them for delivery. Delivery services from our biggest supermarkets have lagged the rest of the retail market, and the rest of the world. The new facilities and agreement will look to double Coles’ online order and delivery capacity, with capacity at each centre between $500m to $750m per year. The hope is that the partnership will allow Coles to expand offering and margins on online sales. Although it is not a huge investment, and once operational it will help lift Coles above its competitors but it seems irrelevant to us in the short term as it has no impact until at least FY23. 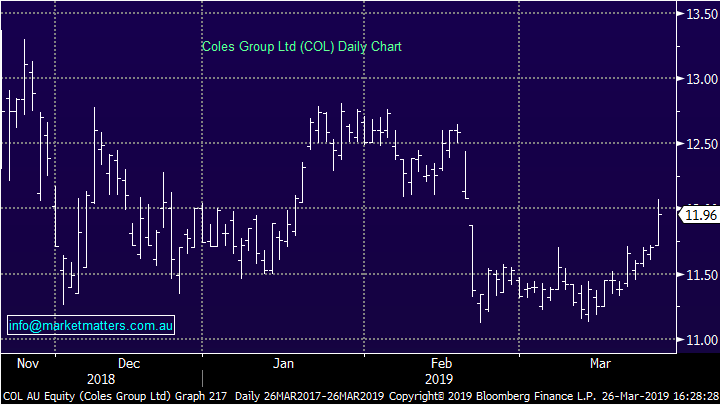 We remain unexcited about Coles in the short term with reasonable debt levels, plenty of investment still to be made while margins continue to slip – however they are doing the right thing for future profitability. 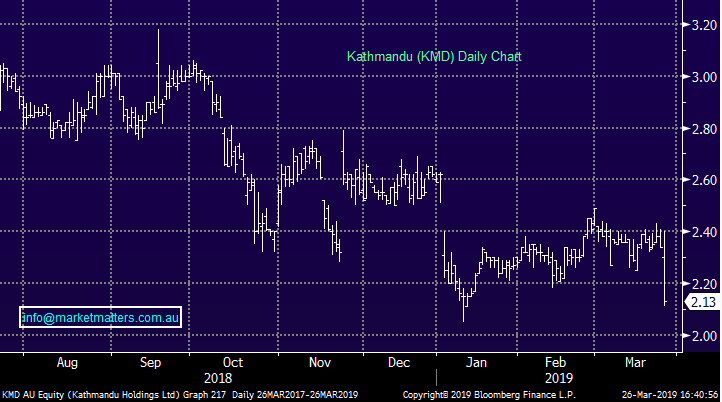 Kathmandu (KMD), -8.97%, the latest of the retailers to suffer at the hands of a result, Kathmandu posted first half numbers that were slightly below expectations this morning and the stock was punished as a result. They posted top line revenue of NZ$232m with the market looking for something in the range of $250m. Profit came in at $13.2m leaving plenty to do in the second half where consensus is looking for $55m for the full year.